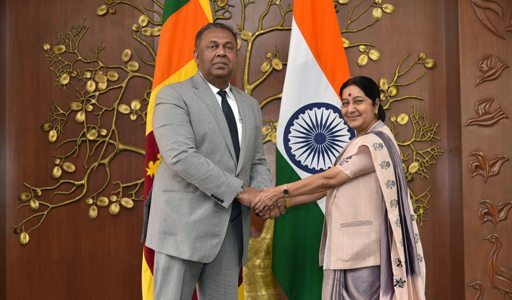 Foreign Minister Mangala Samaraweera who was in New Delhi for a two day official visit on the invitation of the Indian External Affairs Minister, Sushma Swaraj concluded his visit successfully today. This is the first foreign visit undertaken by Minister Samaraweera after assumption of office on 12th January, and reflects the priority attached by Sri Lanka towards enhanced relations with India. 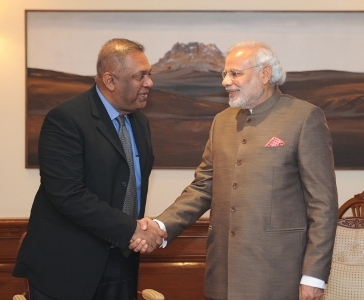 During this visit, Minister Samaraweera held bilateral talks with the Minister of External Affairs Sushma Swaraj on Sunday (18/01) and called on Prime Minister Narendra Modi today. The meeting between the two Ministers on Sunday was extremely cordial and fruitful. Discussions covered all aspects of bilateral relations, with the Ministers agreeing to commence a consultative process to re-engage on the issue of repatriation of Sri Lankan refugees in Tamil Nadu. The two Ministers discussed the proposed visit to India by President Maithripala Sirisena of Sri Lanka. Minister Samaraweera also extended an invitation to Minister Swaraj to visit Sri Lanka as early as possible, which she accepted. The two sides agreed to hold the 9th Meeting of the India – Sri Lanka Joint Commission in Colombo during this visit. 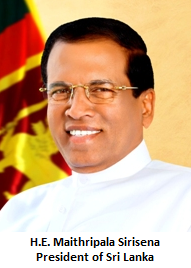 During Minister Samaraweera‘s courtesy call on Prime Minister Narendra Modi today, at the Prime Minister’s official residence, Minister Samaraweera extended an invitation to Prime Minister Modi from the President Maithripala Sirisena to visit Sri Lanka at an early date, which the Prime Minister accepted. This would be the first official visit by an Indian Prime Minister after the official visit by former Prime Minister Rajiv Gandhi in 1987. The Minister said that Sri Lanka is looking forward to the enhancement of economic cooperation with India, which is heading towards great economic progress under Prime Minister Modi. Minister Samaraweera also met the National Security Advisor of India, Mr. Ajit Doval and paid courtesy calls on the Leader of the Indian National Congress, Sonia Gandhi and former Prime Minister, Dr. Manmohan Singh. The Foreign Minister was accompanied by the High Commissioner for Sri Lanka in India, Professor Sudharshan Seneviratne at these meetings.